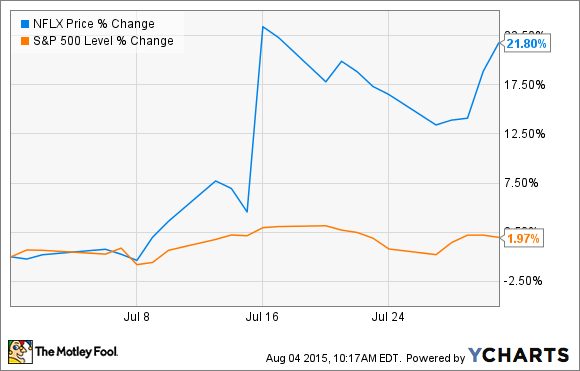 Fantastic subscriber addition results paved the way to massive stock gains in July. In progress now: two important but hugely expensive growth projects. What: Shares of Netflix (NASDAQ:NFLX) gained 21.8% in July, according to data from S&P Capital IQ. While the company is a constant focus of news and gossip -- both positive and critical -- it's very easy to pinpoint the core reason behind Netflix's surge in July. It's all about subscriber growth. So what: The digital video veteran reported second-quarter results on July 15, blowing past its own guidance for subscriber additions. Management had expected to land 600,000 net new domestic subscribers during the quarter alongside 1.9 million new international customers. Instead, the streaming service added 2.4 million overseas customers and 900,000 domestic clients. Investors took these numbers as a sign that Netflix isn't running into saturated markets or overwhelming competition right now, and shares jumped as much as 18.7% higher the next day. Now what: Skeptics will focus on how Netflix isn't planning to deliver any significant earnings or cash flows for the next couple of years. Instead, the company pumps every available penny into two projects: overseas expansion and original content production. Under that first heading, Netflix aims to cover the globe in streaming video services by the end of 2016. That means reaching about 200 nations, up from roughly 50 markets today. Until that's done, whatever profits it reaps in the U.S. will be used to accelerate the overseas expansion. Hence, the stock will look expensive by traditional price-to-earnings metrics for the foreseeable future. A tremendously diverse portfolio of original shows and films will weigh on the company's cash flow statements instead. These investments set Netflix apart from other video services. The two-pronged idea is to reduce subscriber churn while also pulling in new subscribers. As an aside, original material will also shield Netflix from the danger of third-party content producers raising prices through the roof. But these multi-faceted benefits don't come cheap. "Our investment in originals is working capital intensive, which results in higher cash spent upfront relative to content amortization, and, we anticipate this trend to continue given our increased investment in originals," Netflix explained in its most recent letter to shareholders. So both cash flows and bottom-line earnings will stay low. There's an end in sight to these nerve-wracking trends, but it's almost two years away. Hence, Netflix may look like a great investment for buyers with a long investment horizon and steely nerves -- but a terrible fit for portfolios with low risk tolerance and short time frames. Whichever side of that fence you're on, it's safe to say that Netflix knocked its second-quarter subscriber additions out of the park. That's where Netflix stands in August, after a tremendous July surge.